The next-gen Passat will go on sale in the US markets in the summer of 2019; India arrival expected sometime in 2020. Volkswagen loyalists, especially the sedan lovers who have not transitioned to the Crossover trend yet, are in for a treat as Volkswagen has introduced the next-generation of its successful Passat sedan. 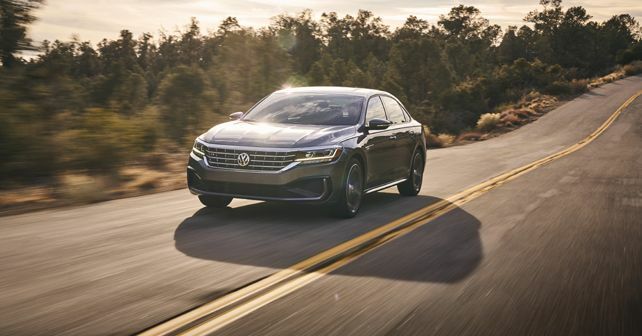 Making its debut at the 2019 North American International Auto Show (or the Detroit Motor Show), the next-gen Passat is an aesthetically-overhauled machine over its predecessor however, it retains the mechanical underpinnings of the outgoing model. The new Passat, in a nutshell, offers a bolder design, upgraded technology and a plethora of convenience and driver-assistance features. A quick glance on the exterior images reveals a dynamic coupe-like roofline, referred to as the 'Tornado Line'by VW designers, which enhances the practical sedan's sporty credentials. The new front fascia consists of a reworked bumper with chunky air intakes and an imposing, bigger-than-before grille which meets the new headlamp units with the help of chrome strip. The new headlights are double-barrel LED projector units which incorporate the DRLs. The same treatment has been given to the rear as well, with crisper LED taillights aligned well with the car's shoulder line and bumper crease. However, a crucial change comes in the form of the 'Passat' lettering now laid out across the width of the boot lid(similar to the way seen on the spy shots of the next-gen Hyundai Elantra). While the car gets 17-inch alloys as standard, VW will also offer optional 18- and 19-inch versions as well. The design overhaul has been continued on the inside too, with the cabin (which hasn't been a strong suit of any of the previous Passat generations) receiving a fresh lease of life. Volkswagen will be offering its V-Tex leatherette and Nappa leather seating options over and above the standard cloth seats, in four colour options. In terms of creature comforts, the new Passat will feature tech like heated front and rear seats, power driver’s seat with memory, and dual-zone Climatronic auto-climate control. Convenience features include power-folding, heated side mirrors with memory, an Adaptive Front-lighting System (AFS) with range control and cornering lights, auto-dimming rearview mirror, remote start, rain-sensing wipers, KESSY keyless access and push-button start, Voice Control, and Easy Open trunk. All of these features will be controlled via a new instrument panel and a glass-covered infotainment touchscreen display. The infotainment system will be offered with Apple CarPlay, Android Auto and MirrorLink connectivity. To take the premium quotient up a notch, the top-spec variant will also feature a Fender Premium Audio system. The new Passat continues to be powered by Volkswagen’s 2.0-litre turbocharged and direct-injection TSI engine, making 172bhp. However, the Indian market is likely to continue with the current 2.0-litre TDI diesel motor. The power is sent to the front wheels via a six-speed automatic Tiptronic transmission but a new torque converter, with updated software, has bumped up the torque output to 281Nm. The 2020 Passat will go on sale in the United States by the summer of 2019. It will be available in four regular trims and a limited edition model as well. We expect this new model of the Passat to reach the Indian shores sometime in 2020.